The Kitchen Cabinet Manufacturers Association (KCMA) is a non-profit organization that represent companies who manufacture kitchen, bath, or other residential cabinets, establishes and promotes standards for the kitchen cabinet industry; defends and advocates in support of the industry; and arms members with valuable tools necessary to promote and grow their businesses. As part of their extended services, KCMA was looking for a third-party company to replace the company that had been providing on-going support and assistance in managing confidential sales, income, and expense information for key member business programs. A major issue KCMA had with their existing vendor was that members did not provide their monthly sales and/or changes were made after reports were finalized. This impacted the validity and reliability of the data. In addition, KCMA found their existing system was slow and not user friendly. They were looking for a company to provide a secure, flexible and confidential data management and reporting system that members could use to enter data and access reports. KCMA was seeking a dynamic data system that could provide participating members with easy access to both historical and current data and reports. what reports would provide key market information needed to evaluate their position in the market. AIM identified that KCMA members wanted a system that was easy to use and navigate, fast and able to deliver accurate reports in a timely fashion. They also wanted flexibility in the download formats for reports/data. The system also built in automatic reminders to make sure reporting was up-to-date. AIM in conjunction with Interline Creative Group worked with key KCMA staff and member committees to develop a “custom” online system. The newly developed system provides members with a fast, easy-to-use platform that gave them the information they needed in the format that works best for them. Plus, the report export function generates individual company reports that provide monthly rankings in sales and YTD rankings while maintaining the confidentiality of the companies themselves. The reports can be formatted in both pdf and excel with month-by-month reports back to 2010. Another system feature designed into the system was the ability for professionals with a member company to have specific access i.e. reports only, data entry administration or a combination of both. The system offered members the ability to add, delete or change member access. AIM and Interline were able to provide KCMA with a custom, password protected, secure, flexible, and fast system that meets members’ data entry, management and reporting requirements. 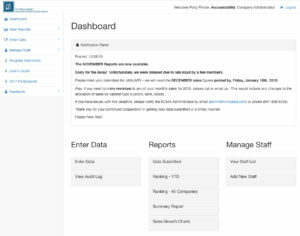 The new system is easier for members to access, navigate and manage their individual and summary reports. More important, members have more confidence that the confidential data presented on a monthly and year-to date is as accurate as possible.